[T0] Project #T0 Take "Lab Safety Course"
Before you start to work in the Lab (at Knudsen A and B floors, but not at the 4th floor), your are required to complete the UCLA Lab Safety training. If you have not done so, please go to the web of UCLA Lab Safety Training. The one you must take is called "Laboratory Safety Fundamental Concepts"
List up the top 10 most important things that we must keep in mind and strictly follow in our laboratory. Post your report at CCLE. Please talk with one of the senior members when you want to start on this project! He/She will provide you with the tools necessary for this project. Place your petri dish with C. elegans under a microscope. Tune illumination, magnification, focusing etc. Become familiar with the operation of microscopes, as well as video recording with MD35 + your Laptop. Ask a senior member for help if needed. Please watch the shape of C. elegans and their behavior. Take notes on as many and you can. Become familiar with shape and motion of C. elegans. Please measure the size of the Field of View (in mm in x and y), using a ruler under the microscope. Take screenshots of the same C. elegans five times. Measure the worms length and width on the computer screen (note that this is not the actual size) and convert to actual size in mm using the field of view measurements. Only show the significant figures. Plot the distributions of each. Calculate the mean and standard deviation of the distribution. Next, try to measure 5 different C. elegans. (one picture per worm is enough). Repeat above. What is the mean and standard error (Standard Deviation) of the length and width? Is the distribute different from 5 images of the same C. elegans? Estimate statistical errors and systematic errors, and explain how you estimated them. ​C. elegans has 959 cells. Estimate the size and mass of each cell. Based on above, assuming you and a worm a common cell size, estimate the number of cells in your body. Them compare it with the true numbers. (You must find out by Web search.) If your estimate is not correct, why is it different from the truth? All the numerical values in the report must have proper significant figures, error bars, and units. Write one-page report and post it at CCLE. This time, you will learn how to measure the speed of C. elegans. Find a heathy, in motion worm, and take a movie using "Time Lapse movie" with 2 second intervals, for 22 seconds. (11 snap shots). This will result in 20 seconds of motion. Measure the head location of C. elegans of each frame (i.e. every 2 second), in (x, y) coordinates with mm units. Use ∆x and ∆y to calculate the distance traveled between each frame. Estimate the speed of C. elegans (in unit of mm/sec). Don't forget to convert! Compare it with a typical speed of E. coli. What is the typical speed of E coli motion? Which is faster? Why?? Compare it with your walking. What is the typical speed of your walking? Do you think a worm moves faster than you or slower (relative to the body size) ? Why so?? We are going to perform a more sophisticated analysis of motion. This time we will investigate the sine wave motion of C. elegans. Use only healthy, good looking, high-speed moving teenagers (2 days). The goal of this experiment is to fit a sine wave function: y(x,t) = A* sin(kx - wt). From a good single shot of video data, fit y(x) = A*sin(kx), where k = 2*pi/lambda. Then measure is A, lambda, and k.
From video data, somehow try to fit y(x,t) = A* sin(kx - wt). If you are not sure how to do, pay attention to one specific point of the body (such as the head or tail), and fit y(t) = A*sin (wt). Or just watch the period of the head and tail motion. Then obtain A, w, T (period), and f (frequency). Write down the wave equation, y(x,t) = A* sin(kx - wt), with your measured quantities. What is the speed of the sine wave v1 (= lambda/T)? Next, following #T2, what is the actual speed of the worm v2? What is the ratio of v2/v1? If v2 is not the same as v1, why not? Can C. elegans perceive v1 or v2? Why do you think so? Compare with your result. What is their v1, v2 and the ratio v2/v1? Keep in mind that your agar is 2% concentration. If the concentration is lower like 1%, what do you expect? By the way, do you think C. elegans moves exactly as a sine wave? If not, why not? Is C. elegans moving like a snake, or moving by a dolphin kick? If it is not obvious by your eyes, do some literature search with your friends in Physics 89. In this project, we are going to learn how to setup the new system for long term behavior observation, and then analyze data by GoodMan worm tracking software. When you start and finish working, please make sure that these items are accounted for and placed in their respective boxes. 2 groups will share 1 light pad and breadboard at a time. Prepare more than five healthy worms on a small agar plate. Optimize the magnification of the camera, and focus on the worms. Make sure that the entire area of the agar plate is in the field of view. Video mode (with 10 - 30 frame per second). Take data for 1-2 minutes. Tame lapse mode (2 seconds per frame). Take data for > 10 minutes. Ideally > 30 minutes. Next, analyze the data by GoodMan. Plot the trajectory (x, y) of the center of the mass. Plot trajectory in velocity space (v_x, v_y) of the center of mass. Then compare your results. Are you finding something similar? We are going to perform a real behavior experiment, using stimulations such as touch and light. Stimulate C. elegans with a gentle tough. Try to touch both a head and a tail. If you successfully begin to observe avoidance behavior, take a video. Take at least 5 good movies for a head touch, and 5 good moves for the tail touch. Repeat using the laser pointer. Do some literature searches, and check out how much we know about this interesting behavior in terms of neuroscience. Find the original papers describing the behavior you observed. Have you seen the same results? Next, let's analyze your movies by using the Worm Tracker. Take a move of freely behaving CE for > 1 minute with something like 10 - 30 fps. Plot the x-position (mm) vs. time (second), and y-position vs. time. Plot the trajectory in x-y plane. Plot the travel distance s (= sqrt(x^2 +y^2)) vs. time. Calculate the speed (= ds/dt) vs. time, x/y-component of velocity (dx/dt and dy/dt) vs. time. Calculate the direction of motion vs. time. Calculate x-component and y-component of acceleration vs. time. Repeat above for at least 10 healthy CE. Do you see any systematic difference in their behavior? If so, why do you think they behave different way?? Thank you for your hard work to complete the basic behavior experiments! Below are real behavior experiments. At least, perform one of them among E1, E2, and E3. If you decide to join the Photon group, then please perform E1 project. If you decide to join the Ion group, then please perfrom E2 project. If you decide to join the Memory group, then please perform E3 project. Otherwise, you are welcome to pick up one of your favorite experiment ! We are going to perform a real behavior experiment, using stimulation by laser pointers and by gentle touch. Also please estimate the intensity of the sunshine in the same wavelength range. By using neutral density filers, reduce the laser pointer intensity so that it become equivalent to sunshine. Stimulate C. elegans by three laser pointers, below and above the sunshine level. If you successfully observe avoidance behavior in one color, change the intensity of that laser, and find the minimum intensity for the avoidance behavior. Is it brighter than the sunshine or dimmer? What color is the most effective to scare the C. elegans? Please become familiar with the Elecgrotaxis setup. Drop 20 - 50 C. elegans on the plate, and observe their behavior. Make sure to take off, on and off for 1 minutes each. Next set up E-fiel to 3 V/cm and 8 V/cm, 12 V/cm etc. (as you wish). Analyze the data. invensigate the speed and direction when E-file is On. Analyze the behavior when E-field is tuned off. Our hand-made Thermotaxis system consists of the following four raw materials. -- 1) Styrofoam, 2) Water, 3) Aluminum block, and 4) Silicone pad (on top of Aluminum plate). Sketch the system, and get a big picture of how system works. Measure the distribution of temperature by -- 1) Conventional Thermometer, 2) IR remote thermometer, 3) IR thermograph . Plot the temperature distribution on the Aliminum plate. Please check the following quantities of four materials. 1) Thermal conductivity, 2) Specific heat, 3) Emissivity. Explain why these four specific materials are chosen. Finally, place a petri dish with lots of C. elegans at your favorite temperature. See how C. elegans are going to behave. 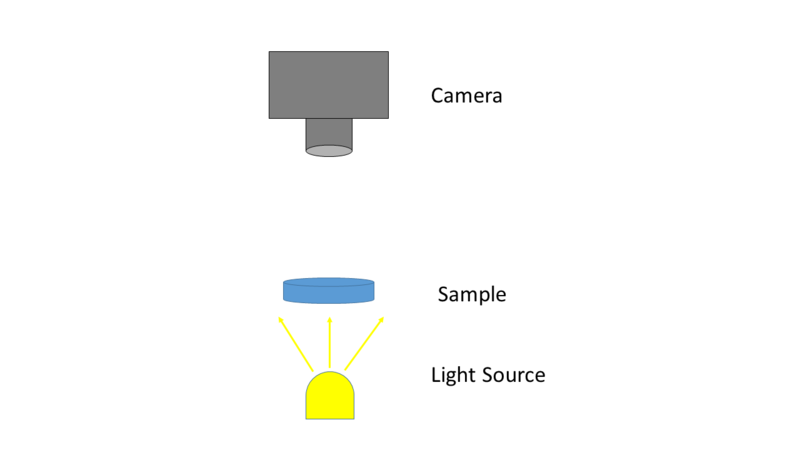 Record by a Canon camera and analyze the distribution of C. elegans.